A major challenge in integrating high penetrations (>20%) of solar- and wind-energy rests in the grid's ability to cope with the intrinsic variability of these renewable resources. Although such high levels of penetration may be a decade or two away in most operating regions, we must find measures to manage the variability of these sources, especially when conventional market-based approaches are exhausted or ineffective. Furthermore, besides assuring reliability, effective integration of high levels of solar- and wind-power can reduce the `hidden' environmental costs and emissions associated with larger than necessary backup capacity. With large-scale PV plants (>250 MW) becoming significant generators on the grid in the near future, system operators became concerned about the plants' inherent variability, and questions were raised regarding the predictability and reliability of the output from such PV plants. In the first part of this research, the variability in the power output of six PV plants in the United States and Canada, with a total installed capacity of 195 MW (AC), is characterized. A new metric called the Daily Aggregate Ramp (DAR) is introduced to quantify, categorize, and compare daily variability across multiple sites. With this metric, and by harmonizing for climatic differences across the plants, we quantified the effect of geographic dispersion in reducing the cloud-induced power fluctuations. In addition, the reduction in variability was assessed by simulating a step by step increase of the plant size at the same location, using individual inverter data. Our data analysis showed maximum ramp rates 0.7, 0.58, 0.53, and 0.43 times the plant's capacity for 5, 21, 48, and 80 MW (AC) plants, respectively. 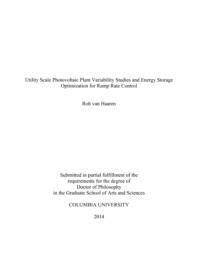 After the variability in plant outputs was understood and quantified, we investigated algorithms for operating Energy Storage Units (ESU) to perform ramp rate control at the plant level. This task is designed to support proposed plans of grid balancing authorities to deal with ramps of variable energy resources (i.e., solar and wind). ESUs can be used to mitigate penalty fees caused by sharp ramps and perhaps allow for additional revenue streams by participating in grid balancing markets (e.g. frequency regulation). Consequently, we focused on building and optimizing ESU dispatch models for controlling ramp rates of individual PV plants within predetermined levels. The model comprised dispatch strategies tailored to specific fast response ESU technologies (e.g., flywheels, capacitors, batteries). The optimization involved trial and error testing of different combinations of ESU technologies, power and energy capacities, dispatch strategies and violation reduction requirements. For four PV plants (5, 21, 30.24 and 80 MW) in various North American locations, we found a required ESU power capacity of 2.2, 9, 12 and 22 MW respectively, to mitigate 99% of the violations of a 10%/minute ramp rate limit. These ESU capacities may add capital costs of about $0.35-0.63 per Watt PV for the 80 MW plant and $0.56-0.94 per Watt PV for the 5 MW plant. Lowering the mitigation requirement to 90% reduces the necessary ESU power capacity (and per Watt PV costs) to 1.1 MW ($0.27), 4.4 MW ($0.27), 6.4 MW ($0.27) and 10.8 MW ($0.18), respectively. Curtailment of power at the inverter during upward ramps reduces the number of violations even further and effectively decreases the necessary ESU capacity to approximately: 0.8, 3.1, 4.5, and 7.6 MW (for the 90% violation mitigation). It is noted that the reported ESU capacity additions and associated costs are based on the assumption of no forecasting or only a one-minute ahead forecasting of cloud-induced solar variability. If forward time forecasting is available, the optimization we developed should result in lower ESU capacity requirements as gradual ramp rate controls could be implemented in advance. Another way to reduce the costs associated with ramp-rate controls is to use the ESU for other revenue-generating activities, such as frequency regulation for which markets exist in different operating regions (e.g. the Real-Time Market of the New York Independent System Operator (NYISO)). Since ramp rate violations in the various facilities we studied, occurred in less than 2% of the time during the year, such additional uses of ESUs are possible.